During a junior year spent at Cambridge University in England, Samuel Rodriques '13 never found time for the kinds of travel experiences that are de rigueur for most American students studying abroad. Instead, Rodriques opted to pursue a one-year master's course at Fitzwilliam College in applied mathematics and theoretical physics. And though Rodriques was not eligible to receive a degree from the college, he opted to go the whole route and write a master's thesis as well. That kind of hard work and focus has paid off for Rodriques, who was named a Churchill Scholar in January. The highly competitive scholarships are awarded each year to just over a dozen U.S. students from 100 of the country's top colleges and universities by the Winston Churchill Foundation, which seeks individuals with the capacity to pursue original, creative work at an advanced level in the sciences, engineering and mathematics. The scholarships pays for all of the fees associated with attending a one-year program of graduate study at Cambridge University and includes living and travel allowances as well. Rodriques's scholarship will amount to almost $50,000. 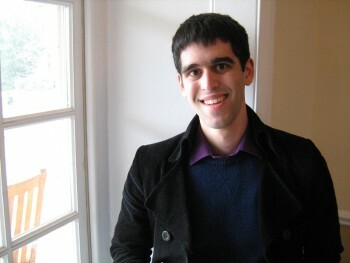 Rodriques, who previously won a Goldwater Scholarship and a Beckman Scholarship, is particularly interested in how computational power can be used to advance knowledge in neuroscience. Rodriques says he has found strong mentors at Haverford for his research interests, and cites in particular three physics professors, Walter Smith, Stephon Alexander and Peter Love.“They have been really instrumental in helping me through my entire time at Haverford,” he says. â€œI met Sam when he was doing research in mathematical music theory with Professor Stephon Alexander after his freshman year,” says Love, who has worked with Rodriques for the last two years. Through Haverford's participation in the National Science Foundation Centers for Chemical Innovation, Love and Rodriques spent two summers at Harvard University doing research on quantum information. As a result, they were coauthors on a paper published in the Journal of Chemical Physics, and the two are currently working on a second paper. As focused on science as he is, Rodriques, a native of Cambridge, Mass., has also found time for a few extra-curriculars during his undergraduate years. In 2010, he was the director of an ambitious and well-received Tri-College theater production of the Stephen Sondheim musical Assassins. At Cambridge last year he served as the technical director for an award-winning production of Jerry Springer: The Opera. And in his spare time, Rodriques is an avid player of the Chinese game Go, which he describes as far more rich in strategy than chess. The game, played on a 19-inch grid, originated more than 2,000 years ago and is popular across Asia. Receiving the Churchill Scholarship is a wonderful recognition, but Rodriques says that the rigorous application process was also valuable in its own right. In particular, the essay (some have likened it to an“intellectual autobiography") that he was required to write made him take a hard look at himself and his ambitions.